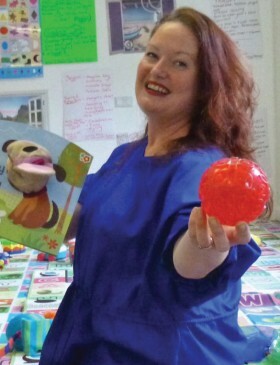 A Bromsgrove resident is using her expertise to offer fun and interactive educational classes for babies, toddlers and preschools in Bromsgrove, Redditch and beyond. Becky Comer recently launched her own business, My Little Angel, to promote learning through song, movement, story telling, percussion, puppets and poetry. Having worked with children, young people, parents, vulnerable families and disabled children for more than 20 years in the public, private and voluntary sectors, Becky decided to transfer her skills, experience and training into an educational and entertainment business. She acquired a workshop room at the Blue Giraffe children’s nursery in Bromsgrove, where she runs daily sessions for different age groups in a bright, sensory environment designed to encourage growth, stimulate and entertain little minds. Weekly sessions also take place at the new 360 Play in the Kingfisher Shopping Centre, Redditch. Sessions last approximately 45 minutes, with time for chat and support at the end. Becky uses three learning strands: Rainbow Fun, Alphabet Fun and Number Fun. “As well as music, we have a treasure chest with items and objects relating to the day’s theme, and a Sensory Star Box with Montessori-approved sensory objects for babies and toddlers to explore,” says Becky. My Little Angel also offers one-off workshop events and regular slots for nurseries, pre-schools, reception classes or kids’ clubs, which can be designed around a theme – plus bespoke birthday parties at your venue of choice.